I would have loved to live in the time when a vast section of North Americawas covered in prairie. My paternal ancestors came to North America from Alsace Lorraine in 1743. They settled in New York, and a few family members moved to Darke County Ohio. This Far Western Ohio County is considered to be part of the “Southern till prairie region.” Ohio areas of prairie were surrounded by savannah and acres upon acres of trees in the central and eastern part of the state. In the early 19th century I can imagine my ancestors may have encountered stands of tall grasses that had yet to be turned under by the settlers’ plows. Much of the prairie that extended from southern Canada west to the shadow of the Rockies, east to Ohio and south to Mexico was lost to settlement, farming and development, as the gradual industrialization destroyed what was considered to be the most impressive, diverse grassland on the planet. Today, many wish to reclaim a piece of this epic grassland through seeding native species. 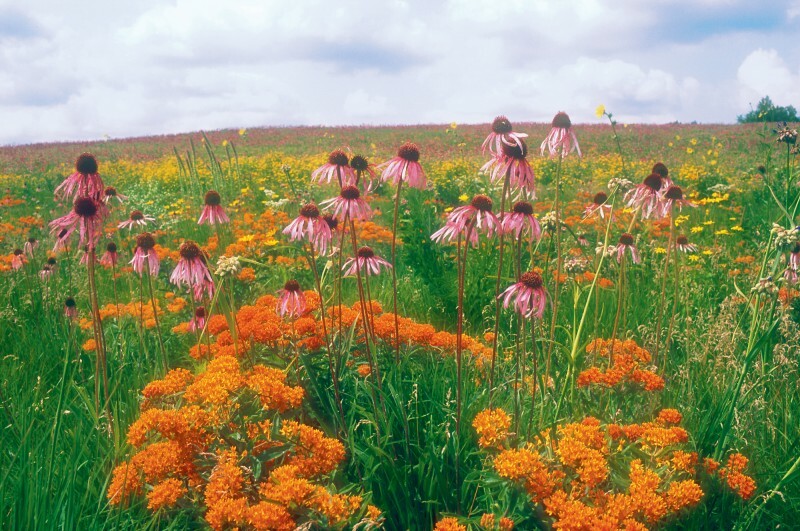 Our attempts to re-create the prairie and restore the legacy of these amazing plants ranges from multi-acre restorations to small backyard plots. The main requirement is patience. Ah, yes, Patience, a word unfamiliar to many Americans. You know who you are, yes, those of us who have little patience for a webpage or a download that takes longer than five seconds. How on earth can we wait 3-4 years for a prairie to mature, not to mention the time it takes to prepare the site?!! Prairies creep, they crawl and then they leap! The prospect of establishing a prairie can be compared to building a new home. We start with the foundation, and then we carefully construct the frame and top it with a well fabricated roof. The steps we take ensure a solid construction, a well-built structure that will stand for many years. This is the best comparison I can offer when it comes to successful prairie establishment. First, Choose the right seed mix! In order to grow a successful prairie it is very important to choose a the right seed mix, with with species that are adapted to the site conditions. Since you will not be providing much assistance in the form of irrigating, fertilizing, or pest control, the plants cannot depend on you to help them to overcome problems that may arise if they are mis-matched to their site. Prairie Nursery offers many seed mix options to match your site’s soil conditions. We can’t stress enough, the importance of the right plants in the right location. How do we begin? Prepare. Site preparation is the most important step towards a successful prairie establishment. Trying to cut corners or overlooking the importance of preparatin will lead to lesser results, or a seeding that you can’t maintain… or just failure. To prepare your site for planting all of the existing vegetation, which may consist of perennial weeds, annual weeds, or both, Must Be Removed. 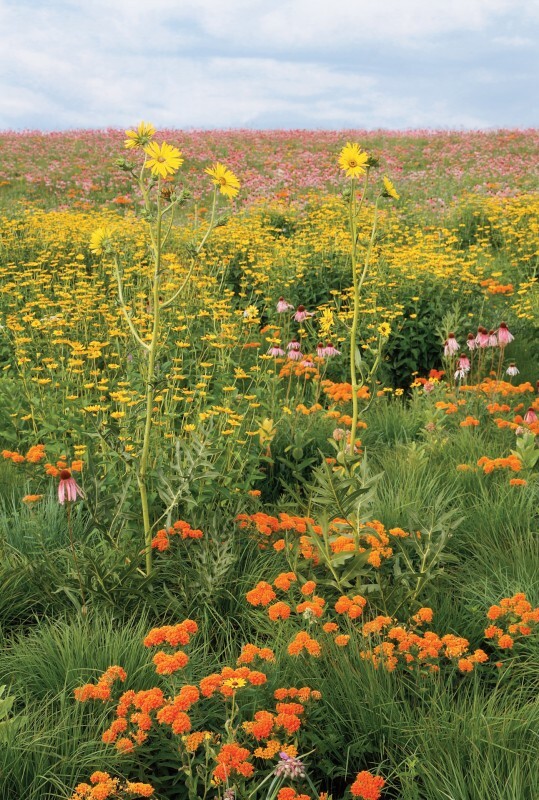 Existing weeds will compete with prairie seeds for nutrients, moisture and sunlight and space. Although it is nearly impossible to remove all annual weed seeds from the seed bank stored in the soil, it is crucial to kill and/or remove perennial weeds and rhizomes before planting. Perennial weeds such as Quackgrass, Bromegrass, CanadaThistle, Canada Goldenrod and Red Clover can inhibit the growth and development of your prairie. Eliminating all perennial weeds prior to seeding is essential to success with your prairie. Site preparation options vary according to the site & vegetation type that you are converting to a prairie. All of the methods and preparation details are covered in our Prairie Establishment Guide. Seeding onto new construction site/newly graded or disturbed soils. Newly graded or introduced topsoil is appealing and often it’s easy to think, why, yes, all that beautifully graded topsoil? It’s ready to plant, right? From a traditional landscaping perspective (i.e. turf), the site is ready to plant, yes. But from our experience, not exactly. All soils harbor billions of weed seeds. Planting without first allowing the site to reveal its secrets (good and bad — usually bad) means that countless unknown weeds will compete strongly with the slow growing native plants. Take the time to prepare the site — even if it looks like it’s all ready to go — due diligence is strongly recommended. Taking shortcuts. All sites require time, usually a full growing season, to remove as many weeds as possible. The only instance when we can attempt a “quick” site preparation is when you are converting a well manicured lawn (a lawn where ALL perennial weeds have been chemically controlled for years, such as a golf course or your neighbor’s Chemically treated lawn). Scattering the seed out to the four winds…. Although tempting, just simply throwing the seed onto your existing lawn or old field will not yield any decent results. The established vegetation provides stiff competition for the slow growing native perennials. Wishful thinking: “I want everything to bloom the first year after planting the seed.” Rapid results with flowers blooming in the first year are not possible with a seeded prairie. If this is a “must have,” then consider installing plants, rather than a seed mix. With a combination of preparation and patience your efforts will be rewarded ! Such a wonderfully written and beautifully executed post. The photographs are truly awesome. I agree that planning and patience are key. Finally after 2 1/2 years of wondering if I did the right thing, my Woodland Edge / Savanna seed mix has sprung to life. I’m so excited at the prospect of seeing it change and transform through the years.